I'm assuming that most people who watch anime have never heard the term "karuta" before. Never mind let me rephrase that since I'm assuming most people don't even understand Japanese anyways haha. So, I'm assuming most people have never heard of the sport/ card game called "karuta." Having said that if I said that karuta was a game revolving a deck of cards; I can only assume that the majority of people would be running away from Chihayafuru like the plague since that's what this anime is based upon. If you have those tendencies to not watch Chihayafuru because it's an anime revolving around a card game, you are immensely mistaken for the masterpiece that is known as Chihayafuru. Yes Chihayafuru is based on a card game, but don't minimize this anime because of that fact since this anime has more to offer than just a bunch of people playing a card game. 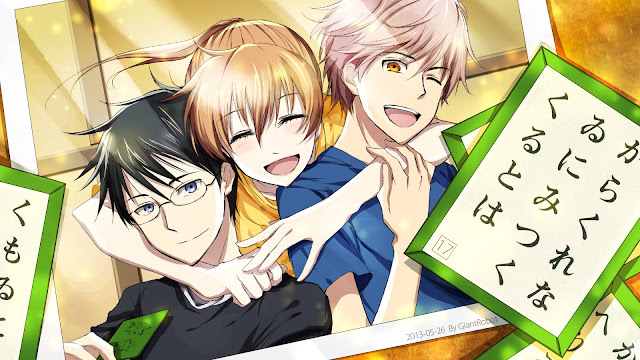 Chihayafuru is an anime about a girl named Chihaya Ayase, who is passionate about karuta, trying to recruit at least four other members at her school for a karuta club. She hopes to teach others about karuta and in doing so also develop her skills in the sport of karuta. On top of that Chihaya hopes to compete alongside her fellow teammates against other high school karuta clubs at tournaments. This whole theme of recruiting members for a club to serve a purpose is a very overused formula used in the manga/anime. Even though it's an overused formula Chihayafuru manages to take that formula and run with it to the hills and never come back. Good animation is a necessity for me to enjoy an anime. It doesn't matter if you animate an anime using bright pops of colour or using lack of colour, as long as you make it work I'll enjoy it whatsoever. Having said that the animation and art of Chihayafuru doesn't have pops of colour of a lack of colour throughout the course of the anime. Instead what I see is that the colours and art in this anime mimics that of what we see in real life, meaning there won't be characters with hair colour out of the norm, or weird animation tactics to spice up the anime. Personally I like this approach because you don't see this form of art in anime as frequent on a seasonal basis. Good job there on the animation and art Madhouse. On top of Chihayafuru managing to bring life to these characters through it's animation, this also extends to the sound that presents itself throughout the anime. The OST is that of a memorable one, I remember vividly when watching the anime, jotting down specific moments where a good song from the OST played. Thereafter I would run though the entire soundtrack trying to find these songs to download. By the end of finding all the tracks I wanted I decided to download the entire soundtrack because I basically had the whole album haha (yes the OST was that good). One of my personal favourites is track number 2, Karuta Biyori, it's very upbeat and reminds me of Chihaya! With every anime people watch, there seems to be a unique favourite for everyone. However with Chihayafuru I feel like there's only one character who is everyone's favourite and that's Chihaya. Chihaya is the meat and potatoes of the karuta club at her school which she formulated. She seems to be someone with tunnel vision, meaning that she thinks about karuta 24/7..... literally. She's funny, she's witty, intellectually she's not the brightest, she's passionate, she's caring and she's the backbone of this anime. It makes perfect sense why she's everyone's favourite. The other main character besides Chihaya is her childhood friend, Taichi Mashima. Taichi is the straight A student who seems to excel in anything he puts his mind to, unlike Chihaya. Both of them became interested in karuta thanks to another childhood friend of their's named Arata Wataya, a descendent of a karuta genius. Taichi seems like the guy who puts on a strong persona out there for everyone but is actually a non-confrontational guy when it comes to his feelings towards Chihaya (yes there's a slight sprinkle of romance in this anime). Because of this quality he seems to draw hate towards Arata since Taichi presumes that Chihaya and Arata share mutual feelings for each other and that he presumes Chihaya is only playing karuta for Arata. At times in the anime I just felt like strangling Taichi because he can't blurt out that he likes Chihaya. I'm in my mind saying, "just say it God dammit! The poor girl is too clueless that she can't even see the red flags! Just tell her already!" I don't know if I should feel sorry for this guy for not saying anything or sorry for Chihaya for her karuta-based tunnel vision for not seeing this. Overall this anime was a pleasant surprise; I was recommended this anime to watch by a friend of mines. Initially I was like this anime has to be more boring than paint drying, what's so interesting about people playing cards? Boy was I wrong. I found myself staring into my computer screen and not blinking for long periods of time because some of the karuta games were so damn intense! Not to mention the spread of comedy throughout this anime had me legitimately laughing out loud. To sum it up, this anime is a MUST WATCH. If you're looking for something out of the water and different from what you are accustomed to, go watch Chihayafuru. It's full of laughs, great characters, and amazing storylines. As always if you made it this far into the review, I thank you for taking the time to read this. I would love to hear your commentary on this anime in the comment section below. Or you can tweet me at animedecoy if you liked my review. Until next time, thanks for reading.